Pelaihari, S Kalimantan (AntaranewsKalsel) - Australian Embassy Staff George Hughes and James Ghaeni visited Brahman Cross Beef Cattle Breeding owned by BUMP PT Cahaya Abadi Petani in Sungai Aris Village, Tambang Ulang Subdistrict, Tuesday 22/5). George Hughes and James Ghaeni, who were accompanied by staff of the Economy Coordinating Ministry of the Republic of Indonesia and other ministry staffs were welcomed by Acting Regent Tanah Laut Achmad Sofiani, District Secretary H Syahrian Nurdin, Assistant for Economy, Development and People's Welfare Norhidayat, Head of Animal Husbandry Agency Suharyo. 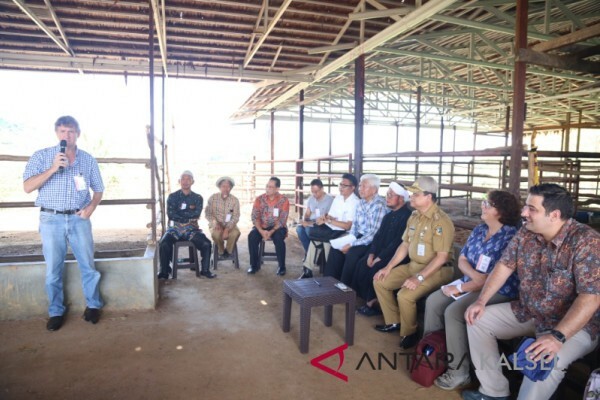 Achmad Sofiani said the livestock sector is one of the prima donna sectors in Tanah Laut and most of the people's economy is supported by the sector. "The population of livestock, especially cattle, currently reaches more than 82,000 heads and almost spread evenly in every village in Tanah Laut," he explained. The visit of Australian Embassy staff was accompanied by National Development Planning Board (Bappenas) staff Himawan Ariyoga, Assistant Deputy for Economic Cooperation of America and Pacific Coordinating Ministry of Economic Affairs Edwin Rizal, Head of Pacific Coordinating Ministry for Economic Affairs Hari Nugroho, staff of Coordinating Ministry for Economic Affairs Ahmad Bhumi. In addition, the Director of Astimpas from the Ministry of Foreign Affairs Edy Yusup, two other staff from the Ministry of Foreign Affairs Elvis Napitupulu and Rizka Praviatianasari and Richard Slaney from IACCB.